It’s our regular feature with posts by and for fashion-conscious riders. Here we discuss the decisions, merits, and enthusiasms behind riders’ wardrobe choices. Ashley Hutchinson Lombard spends most of her waking hours in barns and on horseback. The 31-year old, half of a Maine horsemanship power couple, works in equal stints as a trainer, saddle fitter, and equine massage provider with her bustling business, Whole Horse Works. She often assists her husband, Chris Lombard, at his popular horsemanship and versatility clinics. 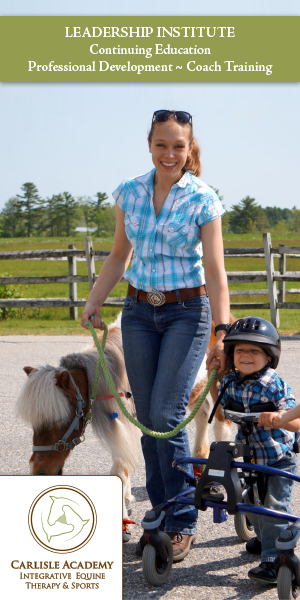 Additionally, she volunteers several hours a month at Ever After Mustang in Biddeford, Maine. Hutchinson-Lombard’s style is casual English wear. Comfort, affordability and durability are prerequisites for any outfit, she said. Thanks, Ashley, for your contributions to the Clothes Horse! Got a style you’d like to submit? Contact us! Ashley wrote about two styles of riding breeches: Full Seat style from Kerrits and Piper by Smartpak. She also weighs in on boot selection. I’m all about these Kerrit breeches! These full seat tights and have an amazing Grip-tek technology that allows for a secure seat in the saddle while not sacrificing any comfort, like some full seats do. They are great for the warmer months when the thought of wearing anything tight and fitting makes you cringe. They are light-weight, durable, and they even have a side pocket – great for carrying gloves, treats, or a cell phone. I am not willing to sacrifice comfort for fashion but these full seat tights offer the best of both worlds. I have no complaints here except that the fabric has faded due to years of wear and tear. Tough enough if you find yourself going off trail – these Pipers made by Smartpak are another one of my favorites. The fabric is exceptionally thick and durable which make these breeches great for chillier months or if you decide to break trail. They offer a synthetic full seat that allows for fantastic stickability as well as a more affordable full seat breech. I would prefer a slighty more contoured waistline, as I sometimes feel the need to wear a belt. With the thickness and durability of the fabric, these Piper’s are sure to last many seasons. There’s nothing more important than happy feet when riding and especially walking around the farm. I’ve always been in love with Ariat boots. Quality, comfort, and all day support are just a few of their attributes. These Hunter Dress boots are slightly more advanced than some other Ariats I’ve owned. The soft, quality leather gives support while providing flexibility for your foot and ankle, and the full length zipper allows for ease when putting them on or taking them off. As most of you know breaking in a new pair of boots can be torture. But with these Ariat Hunter dress boots, I was not left with a single blister!